Identifying “the next big thing” is no easy task, but companies must constantly seek out new business opportunities in order to sustain long-term growth in an increasingly competitive environment. Finding ways to generate additional revenue is at the cornerstone of any successful organization. Drawing on real-world knowledge and experience, this white paper highlights fresh perspectives from a variety of Fortune 500 companies that use syndicated research to gain a competitive edge and drive business growth. 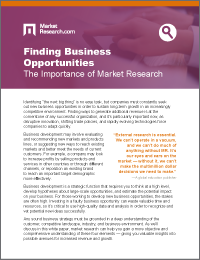 Read this white paper to learn how third-party market research can help you identify potential market opportunities and assess how various products and segments will perform in the future.